Woke up this morning with a hangover and still suffering muscle aches from the other day’s gym workout. Ate some oats and a coffee. Mmm coffee. Started work at noon and finished at 7. It was a fairly ordinary shift. Nothing interesting. There are a few movies out at the moment that I got a glimpse of that look good. I was supposed to go to a 90s bar tonight with my mates but because my wallet got stolen yesterday and I had no money, plans had to be changed. Instead we went for an evening coffee and cake date. It was cute. So that was my (uneventful) Friday. So I’m beginning to lose inspiration and every time I read my past posts I can’t help but cringe at my… cringyness. In an attempt to immerse myself into the wonderful world of WordPress and hopefully combat my writers block, for the next seven days I shall be posting about my day. This could be boring for you. This could be embarrassing for me. However, I’ll try to keep the posts short and simple (just how I like my men… wait, what?). I woke up at 9AM this morning for a dentist appointment. Oh golly, this is already bleak… Bare with me. 9AM is a pretty big deal for me on account of the fact that I’m a lazy teenager and it’s semester break and it’s cold outside (so naturally I’m quite the sloth). I’ve decided I’m going to have my teeth whitened. This impulsive decision has made me realize that I spend money on the most peculiar things. I’m still kind of grieving over last months $200 haircut. I need to do some serious life-reassessments. After the appointment, I met some ol’ pals for lunch. We sat down at a nice looking cafe and ordered water for the table. At a closer inspection of the menu, we discovered that pricing was way out of our league. By a good $10. So we made the combined decision to dash out, despite the fact that one of my friends went to high school with the waitress that had served us the water. Awkward. Before we went our separate ways, I initiated a group hug (there were 3 of us) and didn’t let go for a good thirty seconds. I thoroughly enjoy making my friends feel embarrassed in public. I had my runners (trainers, sneakers, gym shoes… whatever you’d like to call them) In my bag so I decided it would be an appropriate time to break my exercise drought and return to the gym once and for all. 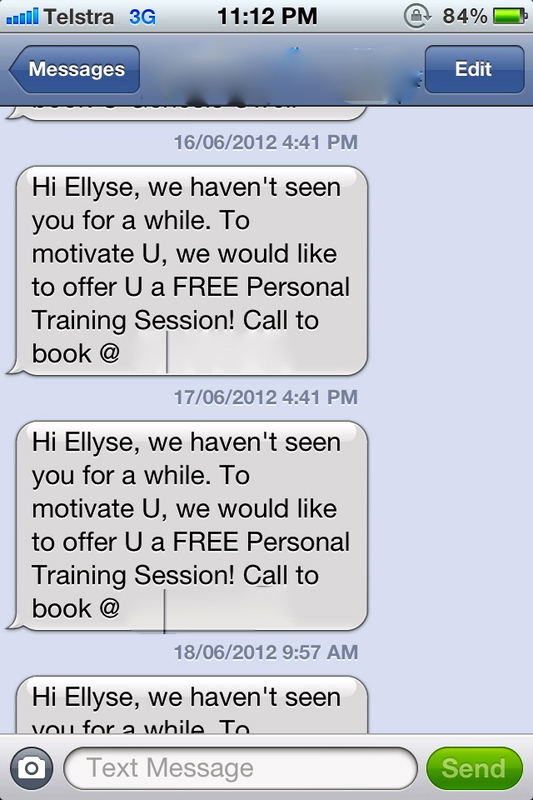 Plus, I have been getting repeated text messages from the gym reminding me of my laziness. I was going to take them up on the free personal training session offer and book an appointment after my workout today but there was a fairly attractive man behind the desk and I was afraid he’d judge me for being lazy. But then again… hot guy… he could potentially be the personal trainer… and the personal training session could end with some hands-on stretching. Okay, my mind is wandering now. I went pretty hard at the gym and I’m going to be pissed if I don’t wake up tomorrow morning feeling the pang in my abs and arms. You know what they say… pain is weakness leaving the body. So that was my Wednesday. It’s 2.27AM, my footsies are cold and I can’t sleep. So I decided to type this, live from my bed on my iPhone. This means I probably won’t sleep for a while now. Damn iPhone!